[New for 2013] Ok, let's start with background. #1 Blue Bunny's 100 years, 100 wishes is still going strong. 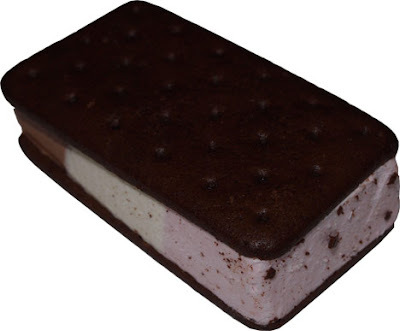 #2 I have indeed tried these neopolitan ice cream sandwiches 4 years ago, back when they were regular size. #3 yup, these were part of our free shipment, so thanks to Blue Bunny for feeding this post! Let's hop to it and get this thing unwrapped! It sure is a mighty looking sandwich, and this one will hit the spot for Neapolitan fans... but like the original sized version, this just doesn't do it for me. I'm such a quick eater that I can never really settle in to one flavor before hitting the next. 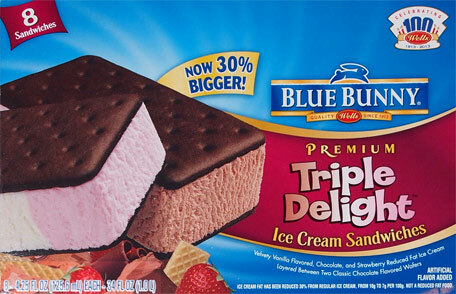 Some people adore the change, but it just doesn't work for me personally in an ice cream sandwich. I'd be ten times happier with just a strawberry on chocolate wafer sandwich (why don't they make that? oh wait, someone does!). So there's nothing wrong here, it's just not my style.